Browse > Home / Cosmology, The Existence of God / What if We Lived in a Simulated Universe and Worshiped a Pimply Teenager? 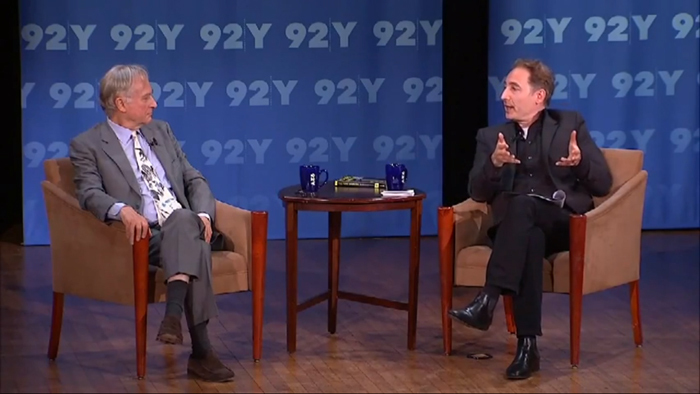 Because the audience at Strange Notions is a combination of Catholics and atheists, I thought the comments in this interview between Brian Greene and Richard Dawkins would be a fun change of pace for a discussion. Here's a summary of the interview. Dr. Nick Bostrom, a philsopher at the University of Oxford, proposed an argument that in the future we will have powerful supercomputers that can create universes 'in silico.' In these simulated universes, sentient beings will exist unaware they are in a simulation (think Matrix). Bostrom predicts that once humanity has the technology to create simulated universes, there will be more simulated universes than real universes because real universes are harder to create than computer universes. Therefore, in totality there are more simulated universes than real universes. "You come home at night. You flick it on. You create a universe, and sort of kick back and watch it happen." Bostrom argues that based on statistics it's most likely we already do live in a simulated universe. According to both Bostrom and Greene, people find this the most compelling argument for the existence of a Creator. Why? Because it cannot be disproven and because this idea renders the Creator not some mysterious being but rather a human being. Greene envisions him as "some futuristic teenage kid with pimples in his garage who just created the universe." In the interview, Greene wants to know what Dawkins thinks of that. Dawkins agrees, "I can't see how you could refute it; I can't see how you could actually be sure we're not." Dawkins also says that if a religion rose up in this simulated universe created by the pimply teenager and he were one of the sentient beings living in the universe, he would not worship the kid. Greene is impressed that there's actually a "logical sequence of words" that gives meaning to the argument there is a Creator of the universe. Dawkins is intrigued. He notes there also has to be a physics built into this simulated universe for it to operate, but that the "pimply youth" could also violate these physical laws during the simulation and suddenly make things happen, at will, that weren't supposed to happen. Here Dawkins seems to get confused. "Um, it's got to be a pretty disciplined pimply youth that sees to it..." says Dawkins. "...as a Creator of this world should be..." interjects Greene. "Yeah, I would say, yes, but that...that we don't, we don't see that, well I suppose we don't, I mean maybe, maybe..."
Correct me if I'm wrong, but it seems that Dawkins, Greene, and Bostrom also find this argument for the existence of a god compelling. I am surprised this is the argument they cannot refuse. I am also surprised Dawkins started to say we don't see discipline in the physical laws of our universe. The scientific method depends on predictability. My purpose, however, is not to deride or ridicule atheists who ponder our origins. We have that in common. These atheist scientists are bearing witness to the "permanence and universality of the question of origins." This inquiry, the Catechism of the Catholic Church says, is distinctively human. And while the Pimply Teenager God of a Simulated Universe idea is just about as wildly mythical as the ancient religions who produced creation myths, it no less represents a search for explanation of some sort. It is at least less violent than the Babylonian creation myth whereby the mother goddess Tiamat spawned monster-serpents as children who revolted against her, planned evil, and dismembered her to form the world as they burst her belly and smashed her skull until she was angered like one possessed and lost her reason. Truly, that would be a world in which you could doubt the discipline of the Creator (or creator-monster-children-serpent-things). Nonetheless, the Christian faith has always challenged arguments to our origins that are different from its own. It rejects a Gnostic god, for instance, who would will people to shun the universe as evil while clinging to the spiritual realm. The Christian view is not based on blind faith, nor does it ask Christians to reject the material realm. Christianity rejects a Deist god who would create the universe and leave it to run like a machine until he felt like tricking people by breaking the laws of physics, just as the Pimply Teenager god. Christians do not believe that God is a puppeteer determining every behavior and action in disconnected instances in time, creating scenarios as he goes. Such strict fideism assumes we cannot know with any certainty what the guiding hand will do next. This view denies that beings have intrinsic natures influencing their behavior, but the view is unbalanced; it over-emphasizes the freedom of God but denies his rationality. On the other hand, the Christian worldview is not strictly deterministic either, as if God created the world like he built a clock, wound it up, and ignored it to tick away time. That view is also unbalanced; it over-emphasizes the rationality of God but denies his freedom. It is worth noting there could be no science in either of these scenarios, or in the Gnostic worldview. On this, I think we all can agree: Strict gnosticism, fideism, and determinism are inimical to science. The first denies the significance of physics, the second denies the predictability of physics, and the third denies the need for experimentation, for in a strictly determined world we would be able to deduce the entire physical system by pure thought. The Christian God demonstrates a fine line between rationality and freedom, a fine line we strive to emulate in our human endeavors. Christianity also rejects a Pantheistic god, who would emanate the universe from himself or be one with the universe as the universe is created and destroyed in eternal cycles of good and evil. While this might make for some interesting simulations for the post-human basement dweller, it is not so good for us humans having a discussion right now. If the universe emanates from God and runs on an eternal cosmic ferris wheel, with all of us caught hopelessly in whatever part of the cycle we happen to have been born on, how could we have any desire for innovation or escape? We are either despairing at the bottom of the cycle or complacently soaring at the top, and we cannot have the motivation or the confidence to learn and dominate the physical laws of nature. Finally, a Materialistic god could not exist, for it presents an internal contradiction. The word "god" typically refers to a supernatural being, or being itself, but a materialistic god would be within the natural world. But a Pimply Teenage god of a simulated universe? I guess I'm wondering why atheist scientists think his existence is compelling enough not to refute, and how an atheist would describe this god should he be the atheist ideal. With the exception of Materialism, anyone who holds these beliefs about the universe's origin could, as Greene did, claim they are a "logical sequence of words" giving meaning to the argument that there is a Creator of the universe. The Christian view of origins, however, is not just a logical sequence of words; it is reasoned from divine revelation. The Christian assumes the universe and our existence is real, that it is not simulated. The Christian God is not only monotheistic, but Trinitarian and Incarnational. I'm sure Catholics here can explain more about these dogmas if anyone wants to know more, but the key word is "wants". Faith cannot be imposed. So yes, I suppose if we follow the line of thought from Greene, Bostrom, and Dawkins and ponder a post-human society someday when there will be a way to simulate universes, then yes, I suppose one could say, in the utmost simplistic of statistical statements, that there would be more simulated universes created with the flip of a switch than the one real universe. But that line of logic only begs the question, "Who created the computer and the computer god, and why did he have to flip a switch?" Yet in the end, I think all of us, Catholics and atheists alike, can agree with Dawkins and Greene here—such a flippant clientele of supercomputer gods would not be worthy of our worship. I like the presentation of the necessary tension between freedom and intelligibility. Especially as it is possible, (my speculation) to identify freedom with space and intelligibility and consciousness, (reflective) with time, or within an eternal context immortality. These I derived from Kant's three 'Ideas' freedom, immortality and 'God'. Just one of my 'crazy' ideas!!!! What are you talking about. Def not physics or philosophy for that matter. I think you're confused. Kant: physical intuitions are: space time, and the universe. Kant: intellectual intuitions: or what he calls -The Ideas. are: Freedom, Immortality and God. (Two corresponding categories). Just making a correlation between the empirical and the transcendental 'ideas'. within the concepts he gives in the Critique. Stacy, that was fun! The article and video were great fun. It may seem bizarre to Greene and Dawkins, but I find the Catholic God exceedingly more worth talking about, pragmatically, than the pimply youth who made the computer simulation. It seems as though, when I talk, I have to refer to things in the world I'm actually in. If I'm in a simulation, then "I'm in a simulation" is only true if I'm a brain in a simulation within the simulation. If I'm in a simulation, then I'm not in a simulation in a simulation. Therefore, if I'm in a simulation, then "I'm in a simulation" is false. It seems then that I can't talk about being part of a simulation. If I can't actually talk about it, then maybe I should find another topic of conversation. An aside; this argument seems to lend itself to solipsism. It's after all much easier to make a simulation with just one real person (or a few), and everyone else is just part of the program. So we probably exist in a simulation like that one. Therefore some of the people we encounter are probably not real. I don't think we can actually entertain these sorts of notions. I agree, Stacy, that it's fascinating the direction Dawkins and Greene took the conversation, though. The universe is so complex and subtle, yet still it would make more sense for its maker to have been a very responsible pimply youth, but not an alien being of great power and intelligence. Because, of course, it's much more likely that the universe was created by methods we can presently understand than by methods we cannot presently understand. I've never understood how solipsism could be ruled out, unless one invokes trust in something outside of oneself and/or one treats as valid the data of one's desires. Solipsism cannot be completely ruled out, irrespective of whether you are a theist or not. I agree that neither the theist nor the atheist can logically or scientifically rule it out. That is why it seems to me that both can only cite trust as a reason for disavowing solipsism. Trust in what? Trust in something trustworthy that is outside of oneself. Call it what you want, it seems to me that you need to trust it / him / her / them. We cannot logically or empirically rule it out as all content is subject to the same vulnerabilities. We just proceed as if the world we observe will be generally consistent. Not because we trust it, or because we have faith, but because there is no other way to be. Is there really no other way to be? Solipsism certainly has its plusses and minuses, but overall I can't see why it's not viable as a way of living. I can't see why you need to sacrifice consistency at the altar of solipsism (if consistency is your thing, I would think you could, if anything, create more of it in a solipsistic universe than you might in another worldview). Extreme narcissists certainly approximate solipsism pretty well, and many of them seem to do just fine, at least by their own standards. It seems extremely unadventurous to me, but it has a great conceptual simplicity to recommend it. Living life like a true solipsist would be paralyzing or solipsism is irrelevant. You can either not act because you do not accept there is sufficient basis to trust your observations, this means literally doing nothing. Or you can act as if there is some basis, which makes the objective and utterly unverifiable nature of reality irrelevant. I don't think there is a third option, even doing nothing is a form of act based on observation that you must accept on some level. Solipsism, true solipsism, refutes the existence of all else. Therefore, in order for it to be true, two other things must also be true: (a) You (the universe and everything) created yourself, and (b) You forgot. What made you forget? What force within yourself made you forget. And, which is perhaps more important, why? In theory, this is paradoxical. In practice, it is maddening (as in it will lead you to the mad house), AND narcissistic to the utmost. With the refutation of the external world comes the discounting of causation and the emotions of others. It is the absolute loneliest philosophy. out to be an unfalsifiable and utterly self-centered hypothesis that my life, the universe, and everything was merely an outward projection of my own mind. “Solipsism syndrome” is common among astronauts, small children who will occasionally believe they’re still dreaming, and—apparently—addicts who have taken too strong a drug too often. I reinforced this with a modicum of philosophy, including but not limited to René Descartes' Evil Demon and Hilary Putnam’s Brain-in-a-Vat, the latter of which was quite literally adapted into The Matrix trilogy. While the idea makes for good debate fodder and stunning cinematography—here I’m thinking of the more recent film Inception—as a practical approach to life it’s actually quite terrifying. In the throws of my addiction I found myself whipping open doors in fear that the next room might not exist and checking under my bed for serial killers like I was four years old. For years I had slid down into a comfortable materialistic view of the world, one that didn’t necessarily need God. Then suddenly I discovered that nothing was absolutely certain. I stayed up all night waiting for the sun to rise one night just to realize that now I needed to wait another twenty-four hours to make sure it rose again. That's the excerpt. Feel free to attack as it's in edit. A lot of people, myself included, have experienced periods of time in their life when they have felt alone, as distinct in a state of 'fulfilled' solitude. But even within conversations how often are we misunderstood? Perhaps this fits in with Wittgenstein's 'There is no private language'. There is perhaps an unavoidable aspect of solipsism in so far as 'others' have a necessarily limited knowledge of what constitutes' me. (Thus the wonder in the idea that only God can know me). I can accept and even welcome the 'reality' that I cannot be completely known by others. The difficulty is that I realize the difficulty in the Socratic self. Indeed, the paradoxes of Godel's theory points to the reality that this desire to have that much awareness has possibly been best represented in the Buddhist practice of mindful meditation. (Don't know about the Christian mystics, but have never found 'method' to this purpose in Catholicism). So I am attempting more and more not to take concepts in an 'absolute sense', which allows me to think there is an element of solipsism, and simulacrum in every one of us. The Catholic answer is called 'examination of conscience' I believe. Thanks, again I find a compatibility, between Buddhism and Christianity, except in Buddhism, and Guy Finley's adaption of this to Christianity, one does not look for awareness beyond oneself, but rather one 'empties oneself' only, with the promise that this will lead to even greater awareness, and even an 'omniscience' if you reach Buddhood, (Godliness?). To achieve this one must 'overcome', even the 'seeds' of karma. Solipsism makes absolutely no sense at all. Not only is it illogical but it's also stupid and irrational. Good comment Paul! Yes, talk about strange notions. The simulation idea is fun, but right, where does it begin or end and what is real? You lost me a bit in the beginning but i am curious why you highlighted the word very at the end? To emphasize how extremely responsible this pimply youth must have been, to keep the physical laws to orderly. I agree that the "pimply teenager" analogy is at best not serious. But why the "simulation within a simulation"? The world which we call physical could be a simulation within the real, ultimate reality. However we view this world, if it's not the ultimate (say, "spiritual" or "the ultimate reality of consciousness") reality, it is a simulation. In essence, any non-ultimate reality is a virtual reality. So, if God creates this sort of simulations, then either he doesn't want us in his ultimate reality, or it is somehow naturally inaccessible for anyone but God, i.e. simulations are necessary. Or, if the ultimate reality is accessible, then these simulations must be training polygons (or "games") for certain purposes. Excellent article, Stacy. Despite some 'discounts' from EN, I believe you repeatedly 'show your intelligence', and give 'evidence' of how busy you are with respect to your studies. This article certainly clarifies for me, some questions I raised in a former post. Thank you. Thank you Loreen! I enjoy your comments. myths, it no less represents a search for explanation of some sort. I don't think so. "Pimply Teenager God of a Simulated Universe" is the outcome of a search for possibilities. I doesn't constitute an explanation for anything because it doesn't involve constraints on the Universe (a Pimply Teenager God could simulate anything or nothing; no insight about our own Universe is derived from hypothetising him or her); moreover, in addition to not answering any questions it raises a billion more - namely, what world does the Pimply Teenager God live in, and how did that world come to be? god should he be the atheist ideal. You seem to be putting way more significance in "they think it can't be refuted" than is actually there. Dawkins and Greene can't refute a Matrix world either, or Last Thursdayism, or any other hypothesis that's set up to match all the evidence we observe. If anything I'd guess that their invocation of the PTGoaSU is just another way of showing how empty "it can't be refuted" is. That said I do agree that "we're in a simulation" holds an appeal to some people that other hypotheses (like Last Thursdayism or Boltzmann brain) don't; I certainly feel that way. I'd guess that this is because simulating a Universe is something we can actually see ourselves doing, and we can picture how this would look like and imagine how things might be like for the entities inside the simulation. Conway's Game of Life is always my go-to example there. From a materialistic point of view it is theoretically possible to create intelligence with it, as it's Turing complete (as an aside: I checked Wikipedia to make sure this was true, and hey someone's managed to create a replicator! So cool). So we have a practical example to work from to imagine what it would be like if the Universe were a simulation. renders the Creator not some mysterious being but rather a human being. garage who just created the universe." There's really no reason the "creator" would have to be a human being; it could be any sufficiently intelligent and technologically-advanced being. There's also no reason to suppose the laws of the "real" overarching universe would have to resemble the laws found within this one (although depending on how constrained the imagination of the "creator" was, they might end up similar in some respects). people by breaking the laws of physics, just as the Pimply Teenager god. But the Deist god isn't usually thought to interfere with his creation, and so is not analogous to a puppeteer. A puppeteer certainly isn't someone who "would create the universe and leave it to run like a machine" at all. I think you've rolled two completely different notions of "god" together under the heading of Deism. I don't think determinism denies the need for experimentation. Deducing the entire physical system "from pure thought" requires knowledge of the initial conditions, since each system state depends on conditions immediately prior. And Catholics know just as well as anyone that "pure thought" won't get you a description of the state of the universe at t = 0. This is why we resort to modelling systems using probabilities even when we think that (at least some) laws of physics disallow any Lucretian Swerve. A lot of systems which we call "stochastic" could still very well be deterministic, only appearing chaotic because they are susceptible to disturbances which lie beneath our reliable measurement abilities. This issue is further exacerbated by the fact that measurement itself requires interaction, and so could actually produce the disturbance which we would seek to detect! Our inability to reliably measure even completely deterministic laws illustrates our need for probabilities: even if there is but one way things are, we are ignorant of it. "The Christian assumes the universe and our existence is real, that it is not simulated." An assumption won't do as a response to an argument. Of course, there are potentially good objections to Bostrom's argument, so your conclusion might be right anyway. I'm thinking the Great Filter is probably relevant to this discussion. Whatever produces the Fermi paradox ensures that we're overestimating the probability of intelligent life arising in this universe. If the Filter lies ahead of us, then civilizations may well collapse before universe-simulating supercomputation becomes a reality. And if that's the case, it is highly unlikely that we are in a simulation. Isn't it the case, for the measurement-related reasons you mention (among others), that there will never be any way to determine whether the universe is deterministic? And in the absence of a scientific determination of determinism, isn't it entirely reasonable to assume that our perception of the existence of freedom is correct? I sort of agree that determinism doesn't obviate the need for empiricism (unless one is talking about some sort of strict logical determinism, where the initial conditions had to be as they were), but in any event, just from a purely utilitarian, social programming perspective, doesn't it seem more likely that a society that believes in the existence of freedom will be more likely to seek empirical verification of their model-based predictions, even when those model-based predictions seem mathematically incontrovertible ? "And in the absence of a scientific determination of determinism, isn't it entirely reasonable to assume that our perception of the existence of freedom is correct?" Maybe. Determinism has always been an extrapolation from scientific findings. We find invariant patterns in nature, and we assume that they're invariant everywhere. Some people also assume that these invariant patterns cannot be broken by other patterns (ex: a person deciding to move his or her arm), and that leads them to conclude that there is no downward causation. Logical entailment is its own sort of demonstration, and these positions attempt to establish determinism by showing that the known laws logically entail certain metaphysical stances. Whether or not they are rational depends on whether or not the extrapolations are convincing, which in turn depends on the evidential import of our experience of freedom. Our perception of the world cannot have zero evidential value (else science would have never gotten started), but it might also lose out to more sophisticated methods of observation. As you can see, you've raised a very tough question. "...doesn't it seem more likely that a society that believes in the existence of freedom will be more likely to seek empirical verification of their model-based predictions, even when those model-based predictions seem mathematically incontrovertible?" It's very possible. I remember reading some psychological experiments (don't remember them off the top of my head, sorry) that claimed to demonstrate increased apathy in the face of determinism. Of course, even if the will is determined, that doesn't mean it isn't causally efficacious. So I wonder if these findings hinge on people's conflation of determinism with fatalism. The former can allow for counterfactuals (if I had done this, then...) whereas the latter can't. If the system determines that a person realizes a desirable counterfactual, then they act differently then they (hypothetically) would have had they not. In a deterministic, non-fatalistic world, people don't possess control over their will, but the will is not irrelevant. So while they in fact might care less, I don't see why they should unless determinism somehow makes the world that much less interesting to them. Thanks for your excellent response. So I wonder if these findings hinge on people's conflation of determinism with fatalism. I don't really understand how anyone who allows for counterfactuals could at the same time disavow the existence of freedom. If one can believe in counterfactuals while being a determinist, perhaps I am a determinist. (Of course, on a literal level, theists are determinists in the sense that we think the course of nature is determined by the will of God and humans and other sources of freedom in nature (one might call those last sources, "angels", perhaps); But I don't think this is usually what is meant by determinism. Whatever is usually meant by determinism, it seems indistinguishable from fatalism to me). If determinism is correct, then there is but one way the world can be given any one set of initial conditions. If fatalism is correct, there is but one way the world can end up given any and all sets of initial conditions. Put another way, determinism fixes the world with regard to its beginning, fatalism with regard to its end. Counterfactuals stipulate what would have been the case given some other set of conditions. In a deterministic world, different conditions will get you a different outcome, but in a fatalistic one, they won't. For this reason, determinism can accommodate counterfactuals. Where people run into trouble is insisting that the initial conditions are also fixed (i.e., the necessitarian position). However, if each world-state depends only on earlier ones, you'd need a different kind of argument to fix the initial state, since it is not entailed by any of the later ones. There's an interesting parallel with the Argument from Motion here. Argument from Motion: Are you referring to 'The Unmoved Mover', or something like that? That helped me in my speculation of relating Kant's metaphysical idea of freedom to space, and the idea of immortality to Time. From this I extended the thesis to relate time to consciousness and space to matter, both of which I 'believe' are 'correct. I thus came to the idea that Aristotle's idea of God, was a God of consciousness, (i.e. will and intellect, God the Father and then God the son), that time was indeed then the 'mover', and if you're ready for this:.... that the material universe in itself does not 'move'. Like in Zeno. independent of the relativity of space and time and their co-dependence or something. However, perhaps it is a heresy that in overcoming the possible paradox/contradiction here this thesis led me to the hypothesize that the Holy Ghost, is somehow related to space, as being the Spirit within empirical reality or something. You see I keep running into different forms of pantheism!!!! i can't remember the distinction I read in detail, but hopefully I understand both this and your good remark sufficiently to make the distinction that determinism implies law and order, or something, (and thus would be compatible with empirical freedom as well as freedom of the will, i.e. consciousness of some sort and in some way influencing matter, and fate which suggests some kind of undetermined rather than predetermined causal chain, and thus if I may put it this way a kind of 'chaos' 'rules'. Our perception of the world cannot have zero evidential value (else science would have never gotten started), but it might also lose out to more sophisticated methods of observation. It is hard for me to imagine my belief in human freedom losing out to a more sophisticated method of observation, because I think my perception of the existence of my own personal freedom is almost as immediate and fundamental as my sense perceptions of the world around me. Maybe I need to reflect on that a little more, but I think that is the case. You do indeed have a reflective consciousness, and the 'perceptions' produced as sensations of the external. I believe it is a life long task to see how they are related. But I believe there is indeed a freedom of the will, dependent of my awareness of both empirical reality, and my own personal and developing ability to (again) be 'aware' of both my limitations and my 'strengths'. In Buddhism the goal is Nirvana. In Christianity also, a heaven on earth. And in the absence of a scientific determination of determinism, isn't it entirely reasonable to assume that our perception of the existence of freedom is correct? If I may, this is something I always wonder but haven't managed to understand yet: in your perception of freedom, does "freedom" mean our choices are uncaused? I will just answer from my own perspective, which may or may not be fully consistent with Catholic teaching. Following on my reply to GCBill below, I think I would say that anyone who believes in counterfactuals believes in freedom in exactly the same sense that I do. On the one hand, with the exception of That Which Is Uncaused (a.k.a. God), I don't think anything is ultimately uncaused. On the other hand, I think that God has given humans true freedom that allows us to be the uncaused cause of things. Those two sentences might seem to contradict each other (and maybe they do), but I resolve that in my mind as follows: when we engage in the freedom to be uncaused causes, i.e. when we exist in a way that goes beyond simple stimulus-response, we participate in God. To the extent that we do that (and no human does this completely, except perhaps Jesus), I think we ARE God. As far as counterfactuals go, I'm not sure what you mean by "believe in counterfactuals". It appears to me that insofar as they're "imagine how things would go if certain conditions were met (that aren't actually met)", counterfactuals are completely unrelated to determinism. That is, when I ask myself "what would have happened if Hitler had been killed in the Beer Putsch", I'm working from a general understanding of how humans and societies work, and of how German and world politics were at the time. Even if you told me "ah, but I've analyzed the trajectory of all the molecules involved back a decade and it is completely impossible for Hitler to have been killed at that point", I can still imagine the counterfactual because I'm not dealing with that scale of detail. Does that count as "believing in counterfactuals", or did you mean something more akin to "believing the counterfactual could have happened" (whatever we mean by "could")? Those two sentences might seem to contradict each other (and maybe they do), but I resolve that in my mind as follows: when we engage in the freedom to be uncaused causes, i.e. when we exist in a way that goes beyond simple stimulus-response, we participate in God. I really appreciate this response; I do think those sentences contradict each other, so I'm glad you went further and explained how you make sense of them. If I may, what's the distinction you see between "stimulus-response" and "uncaused", by which I mean it looks to me like you're positing a continuum of "causedness", from "totally caused" (stimulus-response) and "totally uncaused" (God), and human actions vary between the two. Or maybe you mean that human actions are sometimes uncaused, sometimes caused? It does remind me a bit of the difference between acting "intuitively" and "reflectively"; I don't know if there's an actual distinction but I'm thinking of the thing where we've got some parts of the brain that come up with "impulsive" actions and other parts (frontal lobes?) that inhibit those and allow us to choose actions in a more "considered" way. But while "intuitive" actions sound more like "stimulus-response", I don't feel like there's a difference in causality. If anything I'd think that our decision-making feels more transparent with "considered" actions, and if we know why we took a decision surely that's another way of saying it's caused. With additional assistance from GCBill's comments, I can see how I was being sloppy in equating "[allowance] for counterfactuals" with acknowledgement of the existence of freedom. I guess what I was trying to get at was more focused on the relevance counterfactuals as they related to (perceived) human choices. For example, if you look back at something you did and say, "I shouldn't have done that. ", or, "I'm glad I did that. ", you are implicitly invoking counterfactual scenarios where you did something different, and you are doing so because you think you actually could have done something different. I think that a person who reflects on his or her actions in that way believes in human freedom in the same sense that I do. I like your question about how this may relate to the different parts of our brains, but of course I could only speculate on the relationship between different types of brain activity and free choices. If you can indulge my speculation, I would guess that true freedom is exercised in those rare moments when all of the different parts of our brain "agree" and act in harmony. I expect it will take me a lifetime of prayer and striving to get to the point where I can get my brain to fire somewhat consistently in that way. I have a fairly strong belief that these apparently free choices are mediated through my physiology, and a very strong belief that natural laws are never violated as part of this process. I have an almost equally strong belief that natural laws alone are not sufficient to determine my choices. I see only superficial tension between my belief in natural laws and my belief in free will, and I find that the world makes more sense to me if I maintain both of these beliefs. So, I do. I have an almost equally strong belief that natural laws alone are not sufficient to determine my choices. 1) It seems to me freedom is inseparable from the idea of having control over ourselves and our circumstances; it is when we lack this kind of control that we feel the least free, and surely if freedom means things like "not being hindered in following our own will", this is inseparable from having the ability to do those things, i.e. being in control of our actions. 2) If my choices are uncaused then I don't see in what possible sense I can be in control of them. 3) Surely however my choices are caused, by external factors and internal ones - and I don't mean natural laws or brain states, I mean things like my preferences, my personality, my past experiences, etc. 4) I also have control over those things, but to a limited extent, and controlling them involves the choice to exercise that control, which is itself caused by my preferences, personality, past experiences etc up to that point; eventually we end up either with a cause I can't control, or with an uncaused event i.e. something I don't control either. So ultimately the concept of free will seems contradictory to me, completely regardless of determinism or natural law or anything like that. What is it I'm missing here? By the way, I don't see "free will" being contradictory as a problem for our experience of freedom; it could be like the ideal gas in physics. It's a self-contradictory concept (it's a gas that both has and doesn't have molecules in it) but it gives great approximations of how real gases behave under some circumstances. The idea of "free will" could be something like that, a good approximation of what freedom means to us but not to be taken too literally. I agree that freedom is inseparable from control over ourselves and our circumstances, but I don't quite understand it as "not being hindered in following our own will ", or at least, I wouldn't say it that way. In the Catholic understanding, and in common sense understanding, freedom is a matter of "not being hindered in doing what you are supposed to do". For example, let's say I am held captive by enemies of the state who are torturing me to give up information that could be used to harm millions of innocents. It might be my own personal will to sprout adamantium claws and single-handedly defeat the enemy. But I don't think anyone would claim that that is what I am "supposed to do". What people might claim I am "supposed to do" is to resist giving out that information. Were I able to resist, that would be an exercise of freedom. Several factors might violate my God-given freedom in that case. Regrettably, I suspect that my own somewhat undisciplined love of pleasure and comfort would be a primary factor. I suspect I would cave rather quickly. This is why, in the Catholic understanding, freedom is so closely associated with the disciplining of desire. You are only free to do "what you are supposed to do" when you have disciplined your desires. But then, even I were a saint, no one claims that freedom can't be taken away. Even a saint could be drugged or neurologically manipulated to give up the info. Freedom can be taken away. I agree that all of our thoughts about "free will" are approximations to reality. The same is true of, say, determinism. Determinism is just a human approximation to reality that is useful in certain contexts. This is why I think the truth is best communicated not in metaphysical propositions but instead in multivalent narratives. In the Catholic understanding, and in common sense understanding, freedom is a matter of "not being hindered in doing what you are supposed to do". This doesn't seem consistent to me with some other things Christians say about freedom/free will (I'm obviously taking them to be the same thing, I know they're not necessarily but in this context I think it's appropriate); for example that God will not prove Their existence to us because this would force people to believe in Them, i.e. take away people's freedom not to believe. Or that God doesn't prevent people from doing bad things because this would be incompatible with us having free will, i.e. free will includes the ability to make bad choices. It seems to me none of this would be true if freedom meant "not being hindered in doing what you are supposed to do". Acting well and believing true things (including God) is surely what we're "supposed to do" (and if not, what does "supposed to do" mean), so if freedom meant "not being hindered in doing those things", preventing us from doing the opposite shouldn't affect our freedom at all. Am I misunderstanding you, or do you disagree with the Christians who use those kinds of free-will-based arguments when explaining faith or the problem of evil? Or maybe I was wrong to conflate "free will" and "freedom" in the context of this discussion, and you're using "freedom" here differently from how you'd use "free will". I buy into the standard Catholic connection between free will and evil. I guess you would have to distinguish between the gift of freedom (the opportunity to do what you are supposed to do) and the reception of that gift (exercising your ability to do what you are supposed to do). Improperly using the gift is tantamount to refusing the gift. Much like if I use a great book as a monitor stand (in fact, I actually do), I have sort of refused the invitation to knowledge that this book gives me. So, perhaps one could say that evil arises from the gift of free will, but not from the true exercise of free will. Freedom is the recognition of necessity- Hegel. (which I believe applies to empirical realities as well as states of mind or the will.0 'Thy will be done'. Bostrom's argument also raises another possibility tacitly: a simulated universe with laws that permit simulation could lead to nested simulations. In the hypothetical scenario, we already know that everything within the simulation is computable. I realize that I am not really I familiar with what Catholics specifically mean by "worship", but I would not worship any being or deity. I am happy to praise others who perform good works, but worship is, to me, something demanded by petty tyrants. So yes, I'd agree that beings who simulate universes should not be worshipped, I also would see no reason to call them gods. I also do not see Dawkins or Greene saying that uniformity of nature is evidence for God. It would seem to me that a universe with general rules that are incomprehensibly suspended from time to time, in certain ways, might suggest a being upon whom the laws are contingent, though not necessarily anything supernatural, or a god either. I do not think we see that. I'm not sure whether Catholics believe what they call miracles are a divine intervention to which the laws of physics are suspended or violated, or natural phenomena about which we have limited understanding. What Greene and Dawkins are getting at is that, if we can learn to simulate universes, if we can show that simulated universes are likely much much more common than the original universe, we are most likely in a simulation. This says nothing about the origin or nature of the "original" universe or whether it can have something capable of being understood as an origin. Are not all the many people who live in their fantasies, (and in extreme cases delusions, and hallucinations, etc.) living in 'simulated universes'. Wittgenstein said something to the effect that the universe is different for every person (a paraphrase) because each of us lives in our 'own world'. If this is a proper interpretation of today's discussion, I would not think it is a new or even 'original' idea. Fiction has been a popular form of art for a millennium. And you don't need a computer for that. I think you are referring to subjective universes, but Greene is talking about additional objective universes. It is not a new idea, what is new is that certain scientists believe they can establish that it is almost certain we are living in a simulation. If I recall, it is a function of the math if the universe is infinite, which, according to Greene, it appears to be. It reminds me of Nietzsche's Eternal Return, - like sure the light from those constellations are only reaching me now, so sure, perhaps some one will see the simulation of me, through any light I cast, in the 'far-distant- future' a 'reality' which will not 'really' be me. But I prefer 'theories of transcendence' which is what I strive for me in life in my quest for personal and pragmatic 'growth'.. I feel I can also relate it to the Cartesian 'deceiver', which is understood in the religious tradition, as Satan or the devil. Yes, surely there is a kind of simulcratude (sp?) in that. But then even Descartes defines God as the ultimate reality,(truth! love!) ) and so God might be thought of as the only Being/Non-being* (*a concept even being explored by Catholics, in the post-modernism 'tradition') which is not in any way a simulacrum.. Thanks. I read somewhere that philosophy recognizes four fidelists in its ranks: Pascal, James, and Wittgenstein. (Forgot fourth). Have been trying to 'understand' this concept, but the idea that the belief is not supported by 'objective' reason seems to make sense after reading your comment., But now the meaning of objective truth becomes another problem, especially with respect to controversies regarding the correspondence theory of 'truth'. Wittgenstein said something to the effect that the universe is different for every person because each of us lives in our 'own world'. Since Kant we now have the distinction between phenomenon and 'The Noumea', as well as the Christian distinction between appearance and the 'thing in itself', which Kant believes is 'unknowable'. Although Buddhism has long interpreted the reality of our existence as 'maya', or illusion, (and thus possibly a 'simulation', recently I read of a 'new interpretation', which identifies this concept with appearance. Perhaps there is no objectivity within this world of 'illusion'. If I can accept this, then I will have to reassess my response to an argument of some time ago, because it proposed that we need 'God' in order to secure an objectivity. Hi....came across this video while surfing and you came to mind, since you seem to very familiar with Buddhism, and this seemed to be connected in some way to those concepts. I thought you may find it interesting.I don't claim to understand this stuff myself. Thank you for this Gray. The first video was a beautiful pictorial representation. The second introduced me to an idea of Einstein. The third I did not watch entirely. There was however, I found, confusion between omega point, reincarnation, mention of resurrection at the end of the third video, etc. etc. Although I attempt to 'keep my mind open' with regard of the many speculative thoughts, I also like to maintain distinctions. The omega point to my interpretation however, could be considered to be a synthesis comparable to what happened with the advent of Christianity. My task at the moment is to concentrate and attempt to understand the particular, although this is unavoidable influenced by 'universals', and 'dogmas' and 'ideologies'. Whoops the video of the priest talking from the Augustinian seminary just popped up. . It's about 50 minutes long, so I'll leave you here. Thanks. Ok...thanks.....as I said I have no understanding of this stuff. We have a similar background, and a similar understanding of RCC and metaphysics generally. Will 'Google' your link. Thanks. Couldn't find an 'exact link'. Are you on FB? or is there any other possibility. If not, remember that the more you read and see the similarity and differences, the more you will increase your understanding. That's a very heartfelt comment Gray. If you are coming from a Catholic background but you are tired of Catholic answers that seem "rote", and if you also have some interest in Buddhism, I would highly recommend checking out anything you can get your hands on by David Stendl-Rast. Intellectually I think I may disagree with Stendl-Rast on a few subtle points, but I would still say that he is perhaps the most deeply prayerful and deeply insightful living person that I know of (from any tradition). In the moment I am tempted to say that that is everything you need to know about sin and redemption in 1 minute and 15 seconds (but without ever using the words "sin" or "redemption", and without mentioning that he is borrowing from Saint Paul). Good luck in your search, Gray Striker. You're very much not alone. But look at it this way: you're in a strange dark forest, but nothing in it is going to eat you, so you can just take your time exploring it. Or maybe you are worried this uncertainty might pose a danger? Like if there are demons/evil spirits/Hell at stake? Or maybe depression? I hope you find peace in any case. But there IS a monster in the forest that is going to eat all of us sooner or later, and that is death. I don't think it makes any sense to panic about that, but neither should we "take our time", because none of us knows when death will come. As the Benedictines (such as Stendl-Rast, whose facebook post I linked to above) say, the only way to live a truly good life is to "keep death always before our eyes". That monster provides a great invitation to full life! That monster isn't just in the dark forest though, it's everywhere and it eats the certain and the uncertain alike, so on its own it isn't a reason for the forest to be upsetting. Now some people do think that having certain beliefs, and only those beliefs, will spare you oblivion in some way; if Gray thinks that's likely then I would understand being worried. But that doesn't seem to be what you're saying here. Now some people do think that having certain beliefs, and only those beliefs, will spare you oblivion in some way ... But that doesn't seem to be what you're saying here. I think certain beliefs about death can be very helpful in order to live a good life. But many people manage to live a good life and die a good death without the specific cognitive beliefs that I would advocate. Beliefs matter, but beliefs per se are just cognitive. It is, in my view (and in the view of the Catholic Church, as I understand it) the response of one's heart that "keeps one safe". Thanks for wishing me luck in my search. I should also point out that the possibility that we are living in a simulated universe raises some problems for relying in seemingly supernatural events as a demonstration for the supernatural. Often miracles are ascribed to a divine supernatural power, unrestrained by physical laws, on the basis that these events are not possible under naturalism and that every natural cause has been ruled out. The simulation hypothesis presents another cause, which is not divine or supernatural that could explain these phenomena. If we have to rely on abduction, the most reasonable explanation would then fall on "the simulator did it", before we go to "no natural cause is possible". But I rarely rely on abduction, if ever. What would the difference be between "supernatural phenomena" and "the simulator did it"? It seems to me that by any definition of "supernatural" it would qualify. For example the "breaking the natural rules" definition, inconsistent as it is, would be perfectly satisfied by punctual simulator intervention (picture in the Game of Life, the "natural rules" are the standard "pixel lives under these conditions, dies under those", but it is also possible for you to manually change the status of any pixel you want. Such an intervention would clearly "break the physical laws" of that Universe). I personally do not find the concept of the supernatural to be coherent. But here is how I use the terms. Let us say we witness a car seemingly destroys itself into flames and ash, then reconstitutes itself seemingly perfectly and unaided. We note this observation is inconsistent with what we understood to be inviolable laws of physics and we consider some explanations. 2) The phenomena is impossible based on natural laws, but these laws do not apply in some circumstances or to some agents. It was accomplished by will alone, or something. There is no unknown mechanism, or force, it just happened. This phenomena is supernatural, of some different order than "natural" phenomena. I have trouble with the coherency of number 2, I think for any given phenonmena we can investigate natural causes till the cows come home and if we find absolutely nothing, it is still more reasonable to think that number 1 applies, even if it would mean considering that we are in the Matrix. I think number 2 just labels ignorance of the causes and tries to get out of jail free by proposing another "order" or realm. If we are going to play such cards, mine is that we are in the Matrix. I don't think we ever need to play these cards, I am fine with acknowledging ignorance. I think number 2 just labels ignorance of the causes and tries to get out of jail free by proposing another "order" or realm. If we are going to play such cards, mine is that we are in the Matrix. Are you agreeing with me there? You were saying that simulator action was an alternative explanation to the supernatural, and I was saying that it was a kind of supernatural explanation. Wouldn't the Matrix qualify as "another order or realm"? Obviously the supernatural isn't a coherent or well-defined concept so this question isn't that interesting, but I'm a bit intrigued because I do kind of see the distinction you're making, even though I don't see any reason for that distinction to exist. So far all I've got is genre - the supernatural is fantasy-ish while the Matrix is science-fiction-y, which is why the latter isn't considered a subset of the former. Maybe "simulator action" is over-precise so it doesn't "feel" supernatural, but is it really more precise than, say, a given conception of demons? I am saying that a simulation is a possible, coherent, natural explanation for mysterious phenomena. I would not describe the non-simulated universe as another realm or order, as in a supernatural realm. I would describe it as another universe. I too do not see the reason for the distinction. I do not see any reason to use the word "supernatural" outside of fiction. Let us take a claim. Alan says he met a glowing person who floated in the air and vanished. I would guess he hallucinated or dreamt the encounter and that he did not actually witness anything. If it could actually be shown somehow that there was a thing that glowed and disappeared. I would then suggest that this phenomena was due to unknown natural forces, within our universe or from beyond. This is speculative, but still fits within naturalism. A supernaturalist would reject all of these if she believes a supernatural cause was involved. She would maintain that no natural cause or mechanism could have been involved, but that the phenomena just happened, or happened due only to the will of an agent. It is not just a semantic difference. I think we both agree that to is incoherent or too vague to be believed. But on some level Catholicism does embrace supernatural in the case of God, that being itself, existing in some way independent of any natural substance or law, since these both originate in its nature and will, I suppose. Christianity rejects a Deist god who would create the universe and leave it to run like a machine until he felt like tricking people by breaking the laws of physics, just as the Pimply Teenager god. Though Hume’s final view on religion is not clear, what is certain is that he was not a theist in any traditional sense. Hume rejects the truth of any revealed religion, and further shows that, when corrupted with inappropriate passions, religion has harmful consequences to both morality and society. Further, he argues, rational arguments cannot lead us to a deity. Hume develops what are now standard objections to the analogical design argument by insisting that the analogy is drawn only from limited experience, making it impossible to conclude that a cosmic designer is infinite, morally just, or a single being. Nor can we use such depictions to inform other aspects of the world, such as whether there is a dessert-based afterlife. He also defends what is now called “the Problem of Evil,” namely, that the concept of an all powerful, all knowing, and all good God is inconsistent with the existence of suffering. Speaking from my own experience and upbringing there are however, a myriad of Catholic arguments that can be made for that suffering, based on church teaching, relating to the deserved suffering of sinners and also to the participatory suffering of the innocent as joined to the sufferings of Christ on the cross for the salvation of mankind.Though personally I cannot accept that explanation. A very interesting article and I can understand the effort put into it, and thought that went into the writing. And I am sure that she can also appreciate the variety of thought processes, and tangents that her audience will entertain because of her article Thanks. Dr. Stacy. I do understand that Dr. Trasancos article seems to be a good part as tongue in cheek and I can appreciate that, and it certainly does give us food for thought. Again, it's a good idea to separate the concept of a God who created the cosmos from the stories of the jealous Bronze Age caudillo who is the boss of the Old Testament. Once you reach the conclusion that these do not have to be one and the same, so many of what once were "dilemmas" and "problems" simply evaporate. I have always found it difficult to find information on Judaism. I studied Kaballah once as the only option available to me. Now I follow Rabbi Rumi and his independence in religion, etc. I was however, amazed to recently find definition of Elohim or the saying "I am that I am" interpreted to mean the belief that God is 'always changing', which explained for me in a way, the 'presence' of God within the 'world' in the Old Testament. (Again, a kind of pantheism?) The concept of God in the Aristotelean proofs however, appear to me to be based on (as said) an unchanging, reality transcendental to space and time, and even in the word theology, suggest to me an identification with an identity theory of reality/truth. (I once related the word 'the' for instance to this static identity found in formal logic, in contrast to the prefex 'a' which is used within such contexts and 'an -alogy', i.e. identity as contrasted with a comparative, and sometimes metaphorical 'reality'. On this basis, sure a distinction can be made between the two. What I have found interested is that I have not found in my limited search of Catholic ideas, any explanati8on of 'how' they are related, except the biblical dictate that one reaches the will, or God the father, through the Son or the 'Divine' intellect. The Holy Ghost however, is very seldom mentioned, except when it comes to choosing popes, and having faith that the arguments like in that recent synod on the family, are somehow influenced, or shaped within an empirical context. . Thus, the recent proposals by the cosmologists that the universe has somehow 'created' itself, will be a challenge to the 'merely logical' idea of creation which I believe derives from Aristotle. That pretty much says it all in a nutshell......case closed? What other concept of god would be worthy of Catholic consideration other than the Judeo Christian god of the bible? There are a lot of different conceptions of God in the Bible, including polytheist conceptions and, I think it would be fair to say, approximately deist conceptions as well. All of those conceptions (as well as non-Biblical conceptions) are "worthy of Catholic consideration". Those conceptions have been considered and "tested" by real living people over the course of centuries. According to Catholic tradition, the clearest image of God that emerges out of this vast, paradoxical, complex tradition is that of a human person named Jesus. Many of the other conceptions of God aren't exactly rejected, but are instead responded to with a sort of, "Yes, sort of, but not quite. There's more to it". Ah! but that is also consistent with the emphasis within the Western tradition on the importance of the 'intellect'. I read a Buddhist remark once that in comparison to its emphasis on 'compassion', said that we 'think too much'. and should learn to have 'more heart'. !!!! I don't think you understand me. What I am saying is that Catholicism rejects all other concepts of god other than the Judeo Christian god. At times it is like trying to pull hen's teeth in this venue. Respectfully, I don't think you understand me. Catholicism recognizes that ALL human conceptions of God (including those one develops from reading the Bible) are imperfect. (Yes, Jesus was the perfect image of God, but none of us has a perfect conception of who Jesus is.) That does not mean that Catholicism rejects all human conceptions of God. We are not iconoclasts. To varying degrees, Catholicism recognizes the validity of many different conceptions of God. Catholicism generally takes what David Tracy calls an "analogical" perspective, i.e. there is a lot of, "Yes, God is like X, even though X does not fully express the reality of God". how did Catholicism react to Arianism? Well, I guess Constantine didn't care for Arianism, to put it mildly. And at the end of the day, yes, it was declared a heresy. But, like many heresies, the very need to identify it as a heresy is perhaps evidence of how subtle the difference was from orthodoxy. If you look specifically at what the Arians believed and you look specifically at what the Church now teaches, do you see no overlap? If nothing else, they were working from the same texts about God. No matter how violent the reaction was historically, I would still say that at the level of theology, the orthodox response to Arianism was: "Yeah, close, but not quite." Or, to take a more contemporary example, look at the RCC and the Anglican communion. Does the RCC claim that that Anglicans are "wrong" in their conceptions of God? Hardly. The disagreements, while maintained obstinately, are on mostly very subtle points, so subtle in fact that we love to crib from their best minds like C.S. Lewis and N.T. Wright! Just a concluding thought. This reference to the pimply faced teenager is possibly a better 'proof' of the existence of God than those logical proposals of Aristotle and Aquinas. We have the 'evidence' in our own lives, that this is not a 'perfect' existence. We search for meaning, truth, a higher reality, a better explanation, a more comprehensive 'theory'. . We ask questions, and assume that we can find the answers. .Within the perceptions of the material/empirical we commit to a 'certainty' that we will discover and consequently have a more comprehensive understanding, not only of the world, but our own psychological 'realities'. Do we not in this context also commit ourselves to the 'belief' either in the 'uniformity of nature', and/or that there is a higher 'capacity for understanding through the 'rationalizations' accessible within language,' which in our tradition we can identify within the theological constructs of the traditional proofs what we instinctively associate with our own intelligence, our consciousness, our ability to 'think', to share the 'word', to manifest the reason, or the logos. Do we not, each one of us, aspire to become the 'pimply faced teenager'/ . Do we not desire to 'create' worlds that are not 'mere' simulcras? Yet because of our 'egos' we cannot repeat the words found in genesis, or ''see' that this world is 'good' For this reason, the pimply faced teenaged cannot be 'identified' as God. The "body' or the material universe, as not yet been resurrected. Perhaps science has as much to do in this computer project, as do the clerics and religious. The idea of a computer simulated universe is frankly absurd. To create and maintain a 90 billion light year observable universe with hundreds of billions of galaxies, and keep the physical laws constantly operating throughout, would require unimaginable computing power. It is far more likely that, were our universe artificial, it would be a real universe constructed by aliens from another universe through, for instance, the creation of a black hole. The technology to do so would be simpler than simulation since, once the universe is generated, it would evolve naturally under its own laws from its initial conditions instead of being constantly maintained by a computer. Furthermore, if all sentient races in all universes achieved the technology, the multiverse could contain as many artificially-created real universes as naturally occurring ones. If it is plausible that our universe did not arise naturally out of chaos but was purposefully designed and created, we can at least accept the notion that it was designed which is a great step forward. The only question which then remains would be who designed it, a created alien or an uncreated God? For an alien from another universe to have created ours, a multiverse must exist. Yet, although there are plenty of hypotheses, there is no hard evidence of one. All the evidence shows that there is only one universe, ours, and yet it still shows signs of being designed. In the apparent absence of aliens from other universes, the only conclusion, by default, is that the designer must be God. I don't really see how objects in a computer simulation could have sentience. If I write a computer program to model the sun, the eight plants, and their moon, each object will have a position, velocity, mass, etc stored in the memory. Then I will take very small time steps, and use equations to update the objects position, velocity, mass, etc. At any time I could pause the program and find the position of earth. It is simply a value stored in the computers memory. Perhaps, I don't understand the thought experiment, but I fail to see how a coded simulation could contain sentient beings. Each being is just a bunch of data in the computers memory. But while the simulation was running the relative positions of the simulated Earth and other bodies would evolve like the positions of the real ones do, to a given level of precision. Entities like "position" or "mass" or "planet" would be different in reality vs the simulation but their relationships and the evolution of those relationships would be the same; the simulated Earth would orbit the simulated Sun in every meaningful way. So if we think sentience is inseparable from the properties of our brains like mass and activation potentials and so on then simulations couldn't be sentient, because a (computer) simulation wouldn't have those properties. But if we think sentience is the patterns over time of the interactions between the components of the brain, then a simulation of those interactions would be sentient. It's a bit like, a drawing of an apple isn't an apple. But a drawing of a triangle is a triangle. Of course this all involves the simulation running. Once you stopped it sentience would stop, just like the simulated Earth would no longer be orbiting and you yourself, if frozen in time by Dr. Horrible, wouldn't really be sentient at that time. 1) The simulation is a consequence of the laws of physics coded into the simulation. In our universe, the laws could be the result of our material universe. To me it is not at all obvious that the laws are prior to the universe, as they would be in a simulation, although to be fair, the simulees would probably not be able to notice. 2) Time is discrete rather than continuous. I thought that in most AI thought experiments, the AI was a computer. It has a processing unit and memory. These self-aware beings in a simulation have memory but do not have a processing unit. Those objections seem to say that consciousness narrowly depends on the fundamental nature of the Universe, which is an assumption we have no evidence for. The question is, how finely do you need to approximate the real-life processes of consciousness before a simulation is conscious? And the answer might be "infinitely" but there's no reason to think it is. In fact the existence of billions of different brains that are all conscious suggests there's some leeway involved; we're not dependent on one unique combination of quarks at least. As for the second thing, I'm not sure what you're saying. Nobody thinks consciousness is a static object. Any simulation of consciousness would involve running software over time, which implies a processor to do the running. I was just stating a couple of things that I think are necessary for a simulation, but not necessarily the case in the reality that we observe. If we are in a simulation, what am I (or any of us) in the computer? Just a string of one and zero's in the memory. I don't see how this could possibly have consciousness. Suppose I was going to code a simulation for a body rotating another body. I would give each body an initial position and a velocity. That would be in the memory. I would then create a loop which would take small time steps and calculate the new positions and velocities. The processor carries out these instructions. The new positions and velocities would also be in the memory. Finally, we have no reason to believe that a universe simulation is even possible or that it's probability isn't very close to zero. I'm not talking about simulating the Universe, or of us being in a simulation. You're saying you don't think a simulation could be sentient, which is a completely different matter. If we can simulate consciousness then we can set that consciousness in a simulated Universe different from our own, or similar but not identical. They're completely different issues. As for how a string of ones and zeros can be sentient, how can a set of activation potentials be sentient? Or are you a dualist, in which case: why does an immaterial soul need meat to be attached to? If it's going to be tied to something material you have no idea what the constraints on what that material thing has to be like are. You seem to still be hung up on the idea of static data in memory, when whatever sentience there is would consist of the changes in that data over time. Are you claiming that we can simulate consciousness, but that a simulation could not be conscious? I am not a dualist. I don't think consciousness is computable. I think that's the exact opposite of what I'm claiming. Obviously we can't currently simulate consciousness, we don't have close to the knowledge or the technology required. And I've been arguing from the start that we don't know that a simulation of consciousness can't be conscious (sorry about the double negative; what I mean is, I'm not saying a simulation would necessarily be conscious but I'm negating the claim that it necessarily wouldn't be; i.e I'm arguing the negation of the claim you just attributed to me). If you believe a simulation wouldn't be conscious because you don't think consciousness is computable that's completely sensible (though I don't find that particular abstract convincing; they deplore lossy integration for leading to memory damage over time, which I'm pretty sure is how memory actually works... Heck, memory retention and fidelity is one task that computers beat us on easily); it's also a step back from what I was responding to, which was that you "didn't really see how" simulated entities could be sentient. Or do you mean that you don't see how consciousness could be computable either?
" I fail to see how a coded simulation could contain sentient beings. Each being is just a bunch of data in the computers memory." I have to agree with you. I think we are seeing the result of mentally reducing things that are real objects of experience into "the pieces of data we care about". This has been the ongoing reductionism of the modern era. Then we seem to imagine that all anything actually is, are the bits of data... so we imagine we can reconstruct the universe as-is inside a computer. It is perhaps a sign of the darkness of the age in which we live. I was particularly amused by the statement that "simulated universes are easier to create than real ones." Like we have done both, and know that one is easier. In terms of a "proof" of sorts that we are not living in a simulation: consider whether it is possible to have computer generated sentient beings aware of irrational numbers. Computers cannot store such things, they can only work with real numbers and with limitations at that. We on the other hand can consider irrational numbers, and we know that there is no limit to the size of real or irrational numbers. We also do not know if the universe is computable. As I understand, according to current theories, it would take an infinite number of steps to simulate what is going on in the universe. Can you clarify what current theories you are referring to? If one grants the idea for silly-argument sake that we are living in a simulation, then the obviously enormously superior computing power of the simulator could be capable of making our world seem to us as though things were ultimately incalculable. Like the n-body problem, for example. Even if n-body were still a problem for the simulator, it could still make n-body also look incalculable to us. The simulation could even base the position of its celestial bodies on those of the teenager's world, so that the sky in our world matches that of the real world. What the simulator could not do, for example, is truly hold a number like pi or any irrational number. Or, there are the examples Penrose gives of problems we can solve, which algorithmic machines cannot: our supposedly simulated minds can do things which computers cannot, therefore our minds are not a simulation. I don't know where you get this idea that we can "consider" irrational numbers and computers can't. Certainly neither can fit an infinity of decimal places in their memory. It's not even an intrinsic part of our nature to know irrational numbers exist - that had to be discovered via mathematical proof. And computers are already able to validate mathematical proofs, which is what you do when you're first taught about irrational numbers. The only part that computers currently can't do is come up with the proof in the first place, but neither can most humans. "I don't know where you get this idea that we can "consider" irrational numbers and computers can't." I didnt say that, but where does anyone get any ideas? Where do you get the idea that a computer can handle an irrational number? "Certainly neither can fit an infinity of decimal places in their memory." Humans (some at least) can actually think about irrational numbers, and we have an idea of infinitude or enlessness in the first place which is required for thinking about irrational numbers. There is no corresponding capability in a computer. Computers are limited strictly to numbers which are rational, and within lower and upper limits. There are no such limits for humans. "It's not even an intrinsic part of our nature to know irrational numbers exist - that had to be discovered via mathematical proof." Mathematical proofs are possible to humans because of something intrinsic to our nature. The fact that we can do mathematical proofs says something about us. "And computers are already able to validate mathematical proofs, which is what you do when you're first taught about irrational numbers." You dont need to "validate" something you have proven. I am not sure what you are referring to. "The only part that computers currently can't do is come up with the proof in the first place, but neither can most humans." The fact that one human can do something which computers cannot possibly do, would be evidence that that human is not a computer-simulated human. I remember pondering the question of "How do I know I am not in a really good Virtual Reality video game and have forgotten?" I thoroughly approve of those very practical considerations! I find it frustrating that those same considerations (desire, practicality) are considered inadmissable (by many) when discussing the reality of God. He didn't give those as methods for adjucating the truth, just of "dealing with the question". There are questions for which we cannot "adjudicate the truth" (all of them, if we're being absolutist), but we can do other things to deal with the uncertainty even when we can't dissipate it. For example, when I said "all of them if we're being absolutist"... not being absolutist is one way of "dealing with" questions. Pragmatism is another. Or that's how I interpreted Brian Green Adams' comment at least. No,the above has nothing to do with adjudication truth, it simply accepts that this truth is unknowable. If I cannot exit, or I don't know if I can exit, I still don't know anything about whether this world is "real" or not and this has nothing to with my desires. The comments about safety are to deal with the question of, if this is a game, what if the only way to exit is to die? I suggest not dying to try and find out. What about irrational numbers? Has anyone brought that up yet? ....a sequence of never ending, non recurring numbers. I would imagine the programming of that alone would be quite the feat ...and there are quite a few irrational numbers out there if you would pardon the pun ...In fact, infinity dictates any kind of creation ...although infinity can be a bit of an upsetting subject.